Follow this beginner’s guide to make it through the biggest craft brew weekend on the planet. Lloyd Christmas put it best when he said that Colorado is the “place where beer flows like wine.” The craft brewing scene in the Napa Valley of beer continues to lead the way nationally, so it’s no surprise that the mother of all craft beer festivals takes place in the state. September 20-22, 2018, the Great American Beer Festival (greatamericanbeerfestival.com) will once again take over the city of Denver. Whether you were lucky enough to score a coveted ticket, or not, we have the scoop on how to navigate your way through the hopped-up weekend. Since 1982, the Great American Beer Festival has been showcasing the growing craft beer industry to a very thirsty community of beer aficionados. 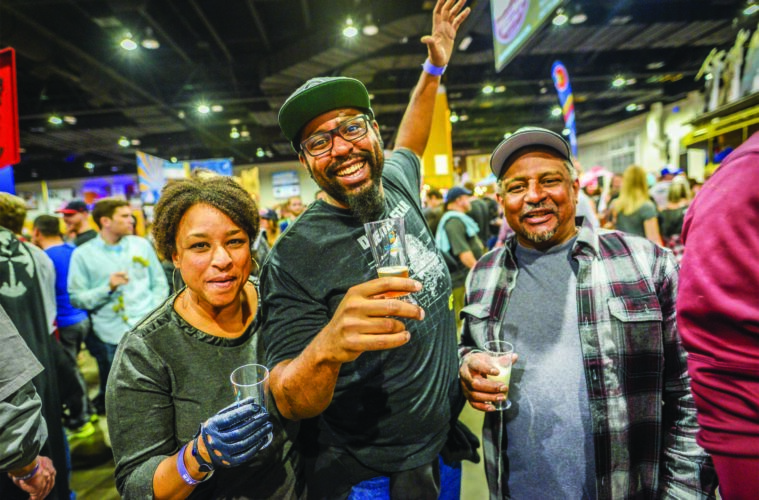 GABF (as it’s affectionately known) will once again take place at the Colorado Convention Center, where more than 800 breweries from across the country are set to pour over 4,000 different beers. The festival hosts four sessions: Thursday evening, Friday evening, Saturday afternoon and Saturday evening. Evening sessions last five-and-a-half hours. Saturday afternoon attendees have four hours to taste their way through the list. Lucky you! The Colorado-based Brewers Association (bewersassociation.org), which throws this big shindig each year, puts roughly 60,000 tickets up for grabs, and they usually sell out within minutes. If you’re one of the lucky ones, here’s what you need to know about making the most of that $85 ticket. First, break out the costumes: Dust off the lederhosen, bust out last year’s Halloween getup, or make your own beer-themed threads—anything goes at this funky festival, and the crazier the better. Two, get here early. Regardless of when you arrive, you’ll still have to wait in that long entry line outside of the Convention Center, but the earlier you make it into the fest, the better chance you have of meeting your favorite beer celebrities, who can often be found pouring at their own booths early in the evening. Three, skip the pretzel necklaces. No offense, but those stale, salty things are so last year. And if you know where to look, there’s actually quite a few places inside the fest to find free food. To indulge in expertly paired craft beer and food matchups, check the schedule at the Beer and Food Pavilion where pairings, seminars, and other educational sessions take place during all four sessions. Each event is free, and hosted by some of the most knowledgable people in the craft beer business. Ditch the map: Tracking down your favorite suds just got much easier. Instead of grouping breweries by region, the new map will be laid out in alphabetical order this year. Also, be sure to enjoy your favorite brewery collaborations. New to the fest this year is a Collaboration Competition booth serving unique, limited-editions. Finally, bring your dancing shoes. Shaking your grove thang inside of the Oskar Blues Silent Disco booth is basically a rite of passage for everyone at the festival. Don’t worry. With so many world-class brewers in town, you don’t need to be inside of the Convention Center to enjoy great beer. Those in town for the festival ship in their best beers and serve them up at beer bars and restaurants all over Denver. And just about every brewery in town is throwing some sort of special event and/or releasing new beers throughout the week. Head to the following Denver craft beer meccas that have a busy and boozy calendar of events lined up for GABF week. At local craft beer-lovers hangout Freshcraft (freshcraft.com) you’ll find over 125 craft beers to choose from and the menu consists of the kind of amazing comfort food that will help you survive a week of liberal pours. Just a short walk from the Convention Center, Euclid Hall (euclidhall.com) is one of the city’s most popular beer bars thanks to a killer food menu and an exceptional beer menu offered year-round. If you end up at Star Bar (starbardenver.com), be prepared to belt out a beer-fueled karaoke rendition of a Justin Bieber song on the bar’s tiny stage. It’s ideal for late night fun and is one of the go-to spots for off-duty beer reps to hang out throughout the week. The OG of Denver beer bars, the Falling Rock (fallingrocktaphouse.com) runs a GABF countdown year-round and is one of the top places in town to find a huge selection of beers on tap—which mostly include rare, aged and specialty offerings during GABF week. The September Issue is LIVE! Rocky Mountain Native Brews The July Issue is Live!